Not that the sunshine ever really left us. It's just that it was so much colder and rainier this winter that everything in the garden is noticeably behind schedule. March was February and April is March. In other words everything in the garden is about a month late or behind its typical spring schedule. Which is very unusual for this Florida girl to experience. But April days have warmed us up rapidly and the non-stop sunshine Florida is infamous for has urged plantlife into the growth usually seen in late February and March. All of a sudden one leaf after the other has emerged from many of the tropicals. Those large red leaves on the Ensete Ventricosum 'Maurelii' banana trees surely help to make the tropical pathway feel alive again. Adding to the effect are the flower stalks on the Hardy star, heracleifolia begonia towering high above the foliage. While we continue to wait for the late arrival of caladiums and Lousiana Irises it's nice to have the tropical garden beginning to look tropical again. The poor Crinum augustum 'Queen Emma' lilies were so sad with all their deep magenta foliage gone only a few weeks ago. As each broad leaf unfurls they are beginning to take on some semblance of their former beauty. It won't be long and all their stately majesty will have returned. Ahhh... spring! 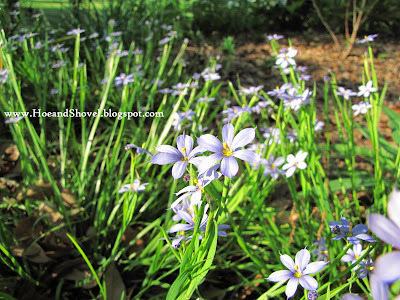 The Sisyrinchium angustifolium blue-eyed grass that usually blooms in March has only recently burst out into their tiny, dainty but consistent flush. These have been divided and spread to many places in the garden this spring. So easily adapted they certainly make themselves at home quickly without much effort on the gardener's part. 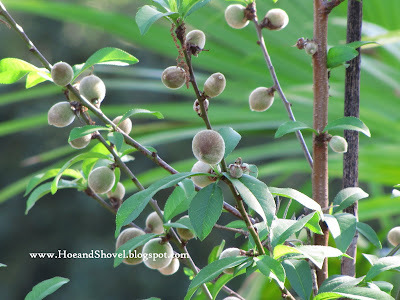 The Tropic Snow peach tree has the cutest little fuzzy orbs in place of the pretty blooms of February. Sited on the new berm I wouldn't know if they are late or on time since it is new to the garden. Having a peach tree that even acts like it might produce peaches is a thrill beyond description. Even the vegetable garden is changing quickly. Now that the soil is warming up it's remarkable how things there progress from one morning to the same evening. Almost in time-lapse vision. Life in the garden seems 'back to normal' with the return of our usual higher temps. I've heard so many Florida gardeners say they 'hope spring doesn't pass us by and go straight to summer'. I'm really hoping the same thing. I'm all for cool mornings and evenings for as long as they will last. I can tell you the garden is happy to have the daytime heat back and it is responding with gentle applause! I love your bloomers. It's such a joy to see what's growing in other FL gardens. You have quite a few that I don't have. It is cloudy, warm and humid down here today, was humid and hot yesterday, so that we turned the a.c. on low. It does indeed feel like the nice cool weather is gone for us until next winter. Meems, it seems so unusual to hear that your gardens are behind, and our plants are blooming two weeks early. It's been too hot here, but we have relief today with normal spring temps of 65 instead of 90. We thought we had gone to summer, too! Love all of your plants. Glad to see your beauties are performing for you. 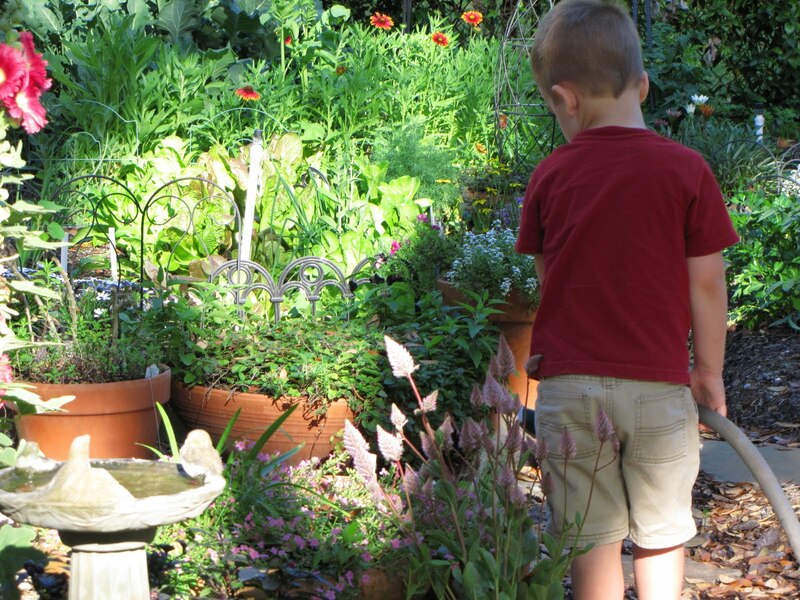 You have such great garden assistance, too! Our garden is about the same as yours regarding the way things are blooming and growing. It was like nothing would grow and all of a sudden with warmer than normal temps everything is growing and early bloomers are blooming along with the little later blooms. Crazy weather. Happy April to you too. 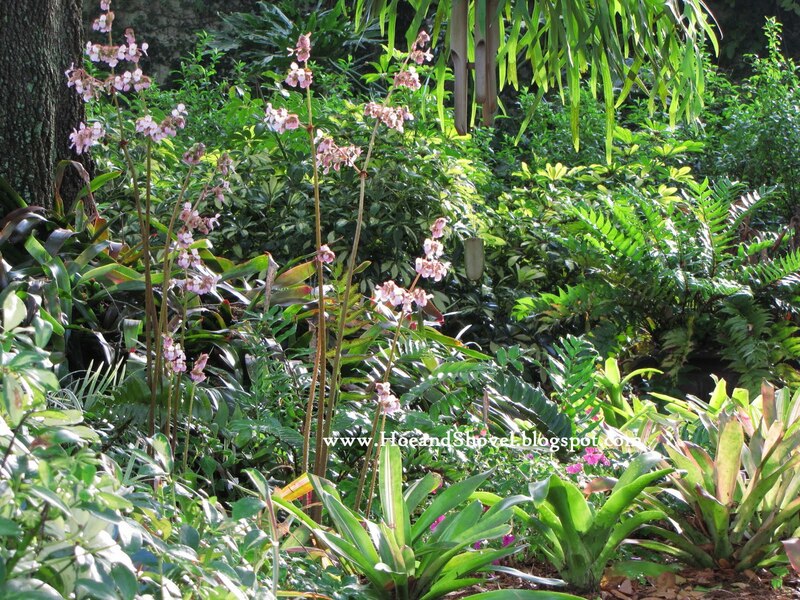 Meems: Love to see your tropical garden again, so full of life and beautiful! What are those two flowers (blue, and purple/pink) with tall spikes in the second picture? Love them! It is interesting that I was drafting a post last night with the African Iris as the first photo as well :) Only I have not got time to complete it yet.. Happy Gardening! Hope spring can stay with us for a little longer before the real summer hits. HI Meems....your garden, as always, is looking absolutely stunning. Everything here is behind to.....a colder than normal winter and spring has only just arrived, so plants are all over the place. I think I may be just as confused as them!! 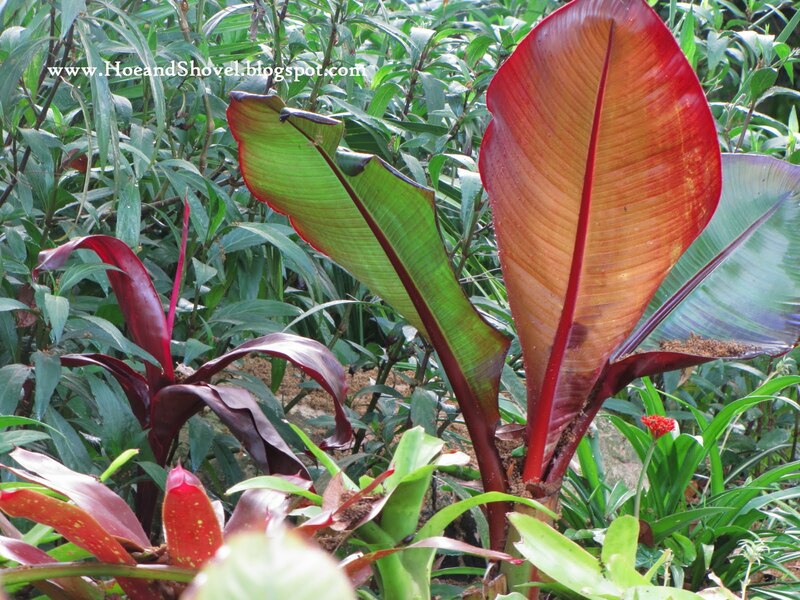 Those banana leaves are beautiful! And I too love the begonia. Will have to look for that one. I agree...things are changing quickly here, though behind schedule, as they were last year also for me. I'm seeing a lot of great signs, though, like new leaves on ti plants and caladiums bursting through. My garden is so much more cheerful when the caladiums are up! The garden is a bit delayed here too Meems. We had quite a few snowfalls this winter and normally we're lucky to see a decent snow every 8-10 yrs. ;) But spring has arrived kicking & screaming at last. Looks like your garden is making up for the delay quickly too. Thanks for stopping by and your warm welcome back. Your Peach tree is neat. It will be interesting to see if it will produce fruit for you there. Meems your garden is as lovely as ever. I'm interested about the peach tree also. Keep us informed. My gardens seem to be late also but are catching up fast. I love the cool mornings & evenings just let mid day be warm. I still have a lot to catch up on myself in the garden due to it being so cool so long. Oh, those oaks. It's raining leaves and pollen like crazy... and yes, that usually happens end of Feb into March. This year it didn't even start until the week before Easter. Yay for your tomatoes. No tomatoes here yet... I didn't plant any grape tomatoes this season. Maybe I should go ahead and do that now... so much to do. Isn't is strange? The only thing I can think of is that your plants are used to the cold and then you got a warm up. Ours were way delayed by prolonged cold we haven't seen in 30 years. Nothing is quite caught up yet but with the warmth they are bound to be on their way in no time. As gardeners we should get used to the crazy weather but it still takes me by surprise. It must be nice after your harsh winter to be enjoying some pretty blooms. 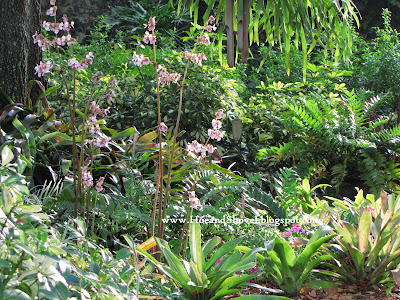 Surprisingly many of the tropicals were protected tucked up under the oaks. But the more exposed larger leaved plants have been 'down' since January. It's nice to see them starting to come back. By summer they should be looking good again. The lavender plant is Lavendula pinnata and the conical feathery spikes are Ptilotus Joey. Both are planted in containers sprucing up the center bed until the caladiums returns. I'm enjoying them, too. 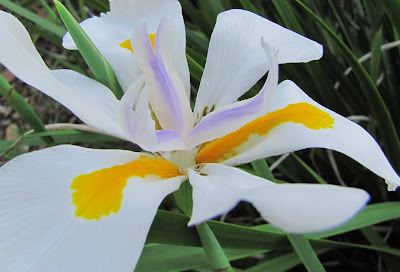 It makes sense that we will be seeing that African Iris on lots of Florida blogs. They are really enjoying the warmer weather and little bit of rain we've gotten. It can be confusing to the plants and to the gardener for sure. But the plants seem to adjust better than us sometimes... we just really don't like it when our spring garden is late do we? My garden bows humbly to the applause as it is lazily starting to wake up from its winter sleep. Not often does it sleep but this winter it was forced into slumber. The Snow Peach is a hybrid for central Florida with the requirement of the chill hours we receive. Remains to be seen if we get any fruit. I'm thinking that blue-eyed grass is good most anywhere ... It's been a fun ground cover. 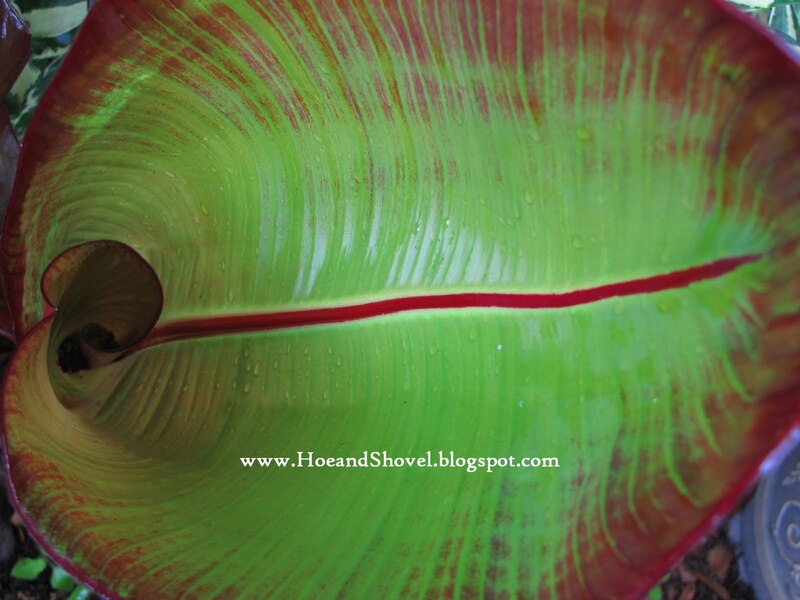 I DO love the banana leaves. Not a fan of the real ones but the foliage on these is just so intriguing. I found the begonias at a nurser in Tallahassee. Haven't ever seen them down here. Thank you. I'm amazed everyday at the difference in the vegetable garden. Short-lived plants have to get out all their growth fast I suppose. The caladiums will return and yes, we leave them in the ground year after year. Our ground never actually gets cold enough to freeze so I'm guessing that is the difference. So nice of you to visit. Lots of snow everywhere north of us... pretty amazing some of the places that got it all winter that don't usually have any. But, wow, when the soil warms up the plants jump for joy like we do. I will be more amazed than anyone if those little orbs turn into something edible. Getting out and about now in the mornings and evenings is so pleasant. We have to do it while we can because it won't last long. Happy spring to you. our gardens are bursting forth too. they are loving the sunshine and the warmth. it is amazing how fast everything is changing. i love seeing your tropicals coming back to life...that banana leaf is exquisite. life is good. Yes indeed - happy April! I'm glad your spring has warmed and your garden is responding beautifully. Hope the temps don't climb too quickly and that you can enjoy some beautiful spring days before the humidity returns. We're having a second rainy day here this morning. It won't be an outdoor gardening day for me, but the garden needs the moisture and I have plenty of inside gardening to do (as well as the less enjoyable, but necessary chores). Hope you have a lovely weekend, Meems.